China's lunar sample program involves upcoming re-entry capsule test to evaluate high-speed plunge into Earth's atmosphere. China is set to launch a robotic moon mission this week, a "trial by fire" test of re-entry technology for the country's future lunar sample-return efforts. To date there has been little official word on this unmanned mission, which may launch as early as Thursday (Oct. 23). It will apparently send a spacecraft around the moon; on its way back toward Earth, the probe will release a capsule to perform a high-speed plunge through the planet's atmosphere. The capsule will parachute onto terra firma to complete its voyage. Chang'e 5 T1 has three potential liftoff dates, experts say: Thursday, Friday or Saturday (Oct. 23, 24 or 25). The mission will launch atop a Chinese Long March 3C rocket from Xichang Satellite Launch Center. The goal is to validate re-entry technology for Chang'e 5, a robotic mission targeted for a 2017 launch that will land on the moon, collect samples and return those specimens to Earth. A central piece of China's moon plans is having hardware return to Earth at a scorching speed of more than 25,000 mph (40,230 km/h). The 31-pound (14 kilograms) 4M microspacecraft — developed at LuxSpace of Luxembourg, an affiliate of OHB AG — is designed to fly by the moon and then return Earthward. LuxSpace has been working with radio amateurs around the world to listen for transmissions from the 4M spacecraft and send in collected data. 4M also totes a tiny dosimeter, provided by Spanish company iC-Málaga of Mallorca, that gauges radiation levels throughout the satellite's circumlunar trajectory. "So far, the countdown is nominal," said Ghislain Ruy, research and development manager for LuxSpace. "We have a long record of cooperation with the China Great Wall Industry Corporation. They are very professional at all levels," Ruy told Space.com, referring to the company that provides commercial launch services for the Chinese government. "However, there is a huge organization … and nothing goes quickly despite some notable exceptions. This mission, for example." 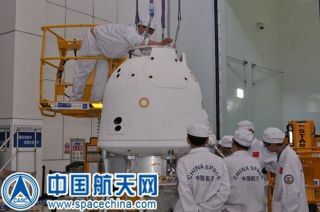 China's space technicians "are amazingly dynamic and determined to [meet] their goals," Ruy said. "Competence, support, hospitality and politeness are premium." Ruy said the 4M mission is a big one for LuxSpace. Hitchhiking payload on last stage of moon-bound China booster is the 4M microspacecraft, dedicated to Manfred Fuchs, who died early this year. 4M stands for the Manfred Memorial Moon Mission. "For us, this opens a new door, even if this is a tiny step and a limited-time mission," Ruy said. "This mission led us to think in other ways, learn and solve new problems and open new paths … all in all improving our competence and preparing our future." China is pursuing a step-by-step robotic moon exploration program, one that would appear to also sharpen the country's technological know-how to land humans on the moon. Yu Dengyun, deputy chief designer of China's lunar probe mission, told the state-run Xinhua news agency earlier this month that the Chang'e 4 moon mission will also verify technology for Chang'e-5. Yu said that Chang'e 4 is the backup probe of Chang'e 3, which successfully landed on the moon in December 2013 and deployed the Yutu lunar rover. Chang'e 4 will help hone the skills needed to attempt the more sophisticated Chang'e 5 and 6 missions, Yu said. Those spacecraft are designed to perform tasks that include robotic lunar sampling and returning those samples to Earth. Meanwhile, several Chinese news agencies have reported that construction of the new Wenchang Satellite Launch Center on the northeast coast of the island of Hainan is nearing operational status. The complex is to be China's fourth and most advanced space launch center. Reports tag it as completely built, making the center the country's first coastal satellite launch facility. Pang Zhihao, a senior researcher at the China Academy of Space Technology, told the state-owned newspaper "China Daily" last weekthat the center will augment the nation's deep-space exploration capability and is the takeoff site for the now-in-development Long March 5 booster. As China's most powerful rocket, the Long March 5 is slated to loft the Chang'e 5 moon mission, Pang said. Leonard David has been reporting on the space industry for more than five decades. He is former director of research for the National Commission on Space and is co-author of Buzz Aldrin's 2013 book, "Mission to Mars — My Vision for Space Exploration," published by National Geographic.Follow us @Spacedotcom, Facebook or Google+. Originally published on Space.com.